The 1st Saturday of every month our club hosts a 3 hour "turning target practice" open to all shooters. This practice is also an instructional opportunity with accomplished shooters (1 a former AMU team member) discussing BE fundamentals, shooters asking questions or giving their input - I view it as the Bullseye-L electronic forum in the physical forum. Over the years we have introduced many to the Conventional Pistol discipline (Bullseye). A few continue on to shoot the 2700's in the area, some chose to only shoot the .22 leagues, and some just the turning target practice each month. We were getting 15 -20 shooters each month until this current ammo shortage. We suspended this practice for 5 months, started again yesterday with 14 shooters showing up due to the availability of .22lr, so thanks to the ammo company employees for working 3 shifts!!! Conventional Pistol matches are like a good Boy Scout Troop, it takes a few very dedicated individuals to keep it going and luckily the Seattle area has a bunch of dedicated clubs! How does your club do it? Let's help each other with ideas. That sounds good Wes. Down in Eugene, we are only a few Bullseye shooters as you know. Only two of us seem to want to run a program but our day jobs and other commitments leave too little time. Add in my 89 year old mothers requirements for me. There is another guy near here that shoots a lot but does not seem to want to run anything. Plus most other pistol shooters here just shoot paper plates at 20 feet. Quickly. Organized shooting seems to be foreign to them. Next spring I plan to shoot a lot of sustained with 220, 228, 92*, PPQ and challenge the paper plate crowd to join in. Luckily the 220 has the Sig 22 conversion which has proven to be pretty good. The local club I'm involved with has no turning targets. Does anyone have any experience and/or insights on doing some buzzer-based club events just to introduce the general ideas of BE Pistol? GrumpyOldMan wrote: The local club I'm involved with has no turning targets. Having just begun this sport I am short on insight. Our club has air operated turning targets indoors (that season just started so I have shot a total of one practice and two 300 matches on turning targets in my life.) For outdoors we have one of those big old (I recall seeing the same timer at the club where I learned Jr Smallbore Rifle in the 60's) timers that you can plug the horn of your choice into to 'announce' cease fire. We don't have a 'dedicated match director' (at least to call the line) for these league matches, one of the senior shooters who is on another relay will call the line and try to hold a steady cadence, at 'Commence Fire' he also flips the timer switch on. We do get an occasional early or late shot and I could see that being an issue during more 'intense' events. Short of having multiple Range Officers to 'police' the line, I don't know how to keep things more exactly correct. We (as I am learning) are a rather laid-back group who only use the 'summer' season for continued practice and to play with 'other guns'. Our Indoor Range was until this Fall limited to .22 lr rifle and lead, non-magnum handgun ammo due to the backstop steel not being hardened. We thought we were 'doing good' back in '87 when we put that plate up and went from 4 individual 'chunks' of steel to range wide, floor to ceiling coverage. None of us shot Bullseye, we were looking to get winter (smallbore) rifle practice and had no thoughts about it limiting future horizons. Actual Bullseye shooting indoors has 'always' been limited to small bore but I don't know if the range or members interest was the limiting factor. Things change, perhaps now there will be interest in shooting center fire indoors on the turning targets, idk. I had to dig around past that to find the rule book. The latest one has Rule 6.8(c) on how a Registered Tournament without turning targets as required by Rule 6.9(a) (they break that day, I guess) can be canceled or run as an approved one, but there is no Rule 6.9 in the document I downloaded. So, piecing things together (including from the rule on target frames), turning targets are necessary for only Registered Tournaments, using a buzzer is fine, and it sounds like a few clubs at least do it that way. I had forgotten about the near-universal use of those GrayLab darkroom timers on indoor ranges. Guess you could have a pretty good timed or rapid fire string using the timer to run the lights downrange...??? While thinking of ways to get my fellow enthusiasts out to try the 22 portion of a monthly match, I thought of offering to supply the ammunition. (Hey, 100 rounds, I can afford that). This led me to the idea of a club having a new shooter kitty as a way to attract new shooters. "Bring your 22 pistol and give it a try." I practice at my local indoor range during public hours all the time, and I always hear people explain to their friends (usually other new shooters) that I'm shooting "competition" and they talk about my "special setup" (my range box, spotting scope, and my brass catcher). I don't generally engage them unless they ask me directly about it. Then I'll explain what the game is and give them my 'business card' (my name, email address, and details about my .22 Bullseye league printed on a business card). Usually that's about as far as it goes (I've given out maybe a hundred cards in the past few years), but a few people have actually tried the sport and stuck with it for a season. Every now and then we'll have someone simply show up to the league night and just start asking questions, and I'll usually be the one they're directed to for information on how to get started. Since they've already taken the first step in just showing up, I'll invite them to jump in and shoot (which they generally will do) -- and my league's new "Probationary" program this season (with 2-handed shooting allowed, but using the full distances and timings, and with their scores not contributing to the team scores) helps ease the intimidation of attempting to shoot one-handed a bit. A number of shooters have taken the plunge and switched to conventional one-handed shooting as well. Generally, though, the 'new' shooters are middle-aged and older folk; very few young people are shooting in my league. We do have a 13 year-old junior shooting, but she's shooting Probationary with the focus of learning trigger control so that she can compete in the faster-paced 3-Gun run'n'gun competitions. I'm 30 years old, and definitely on the low-end of the age range for our league (and for Bullseye shooters in my area in general, though I'm not the youngest competitor). I suppose the takeaway from this is that I prefer to build interest in Bullseye and in our local Bullseye league in a relatively slow way - by simply shooting it all the time and allowing the curious to approach me, rather than actively seeking new participants. I find the ones who ask are more likely to actually give it a try, and of the ones who do try, most stick with it for at least a season. It doesn't tend to attract the younger folk, though. Themes could be along the lines of measure your skill with a standard that has challenged the nation's best shooters since 1921. I finally found a history that goes into the courses of fire, and the NMC was first fired in mostly its present form in 1920, but on a different target. Perhaps the tag line for the whole 3-year campaign should be "Because it IS hard"
When was the first 300 fired on the NMC with the .45? Centerfire? Rimfire? I found a genuine BE shooter at the local range last week and this week was able to talk to him. Just might be able to put together an event or two as soon as this spring if I can get a few people to help. He got a local club near Sacramento to put in turning targets, but only a few months before moving out here. Sadly I think todays world people expect to just go right in and be the best... if they don't have the skill, they try to buy it. Not as much pride in learning, and mastering a skill. "When was the first 300 fired on the NMC with the .45?" Was it T.D. Smith back in the early 1960's? I have had the pleasure of introducing a good number of new bullseye shooters to the sport, primarily by taking a bit more proactive step then rvlvrlvr when receiving questions about my gear. I always offer to let the interested party shoot my pistol, and after they get started, I take a target and write down my email addy, some good websites to look at (including this one), and tell them when the next match is with an invitation along with a offer to use my equipment to get started. I challenged a AR shooter to a NMC, his AR 15 against my 22 pistol at 25 yards, posted the targets, and won! went to the local watering hole afterwards. He says he is going to be at the first indoor match of the season come December. In case your wondering I scored 281---- 85 slow fire, 98 timed, and 98 Rapid, not that good. The AR 15 we did not score, from the group it appeared that the slow fire was in the 70's. Oh that AR shooter used his AR? There might be a couple of variations of this; trade guns as mentioned, 4 man teams, .45 vs AR's. An opportunity for conviviality and good natured barbs and w/ teams exposure to more shooters. The contest might be other disciplines, possibly the run 'n gun boys? Locally, what I'm thinking of doing is a few *introductory* events before working up to an actual approved match. That pistol range on the east side of the old BRPC indoor range had turning targets on something like a 5-foot lever that it looked like they had to really grind on to get the movement they wanted. But I was young back then. My modest contribution. I posted last summer that I was going to setup a simple pistol bullseye league with family and close friends. Well I got it started with 9 members. 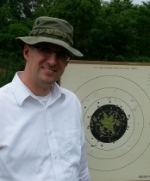 My league charter is to provide an organized forum for novices and part-time shooters to re-hone their marksmanship skills, provide for some head-to-head weekly competition, and, by example, show others how much fun this is. We're using Bill's Gun Shop and Range in Hudson, WI. My intention is to make this a 10 week league each winter. I allow any conventional pistol (.22 up to .44 mag), one or two hands. My specific rules get more detailed. We shoot 10 shots at three B-2 targets at 25 feet each week. Sum up the 30 shots. I have a score handicapping system to normalize the talent. I'm using Google Drive to post scores and pictures of each person's targets (raw and scored). This is a very simple league and doesn't conform to NRA bullseye but I can't tell you the number of comments I've heard from the members how happy they are to have an organized (yet flexible) shooting league that gets them out to shoot. Over Thanksgiving, my sister-in-law said she wanted in with my brother for next year so that puts me up to 11 people. I told my members that at the end of the season, we'll discuss what we liked, what we'd like to change. We rent the shooting lanes and depending on how much people "shoot-ahead", buddy up on a lane, practice, etc, I estimate the league costs each person $350 to $500 for the 10 weeks. Money well spent in my book. Love this forum. Got my eyes on a Kimber Team Match II for summer maybe.